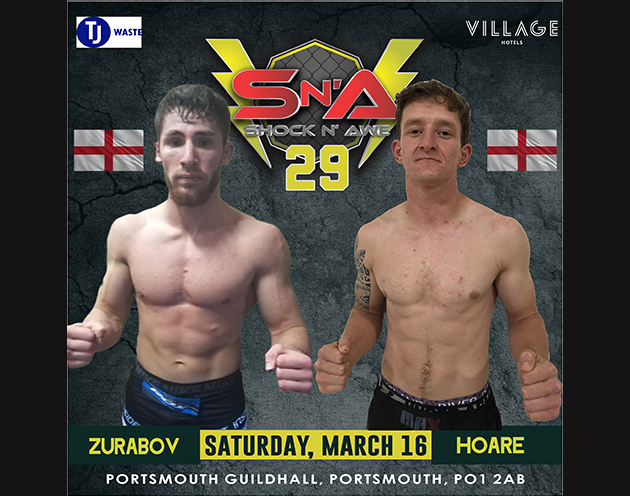 Unbeaten prospects set to clash at Shock n Awe 29! U155lbs Dale Hoare 3.0.0. (Gym01) vs Maga Zurabov 2.0.0. It was in the summer of 2017 that Dale Hoare decided to walk through the doors at Gym01 in Portsmouth and since then he has never looked back. With a fantastic work ethic Dale has become a real prospect in a very short time. So fast forward two years and he has racked up an impressive 3.0.0. record including a real war with Adnan Bushashy (see below). Next up is Maga Zurabov who is travelling over from Ireland, looking to give Dale his first taste of defeat. Training out of Cork, Ireland, under the watchful eye of Dylan Sheehan, this Samson Martial Arts prospect has finished all his previous opponents inside the distance so will be riding a wave of confidence when the cage door closes. Will the home crowd be silenced or celebrating once these two warriors have collided?